Gameplay stats for Farideh—main character from Erin M. Evans’ Fire in the Blood! 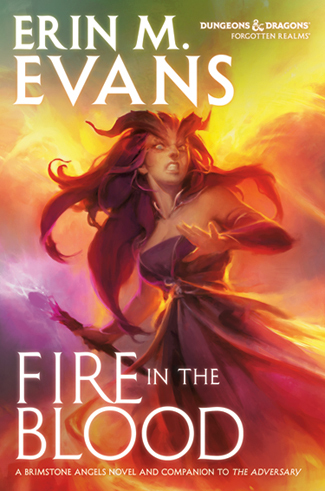 In a direct follow-up to her third book in the Sundering series, Erin M. Evans throws her signature character Farideh into the midst of a battle for the throne of Cormyr. As the war brought on by the Sundering rages across Faerun, princes and princesses, wizards and rogues scheme to capture the seat of power of the Land of the Purple Dragon—with Farideh and her allies caught squarely in the middle. Fire in the Blood releases October 14th—and last week, we had the pleasure to speak with author Erin M. Evans about this latest novel, the Brimstone Angels series in general, and Farideh herself. Today, we’re also thrilled to present the gameplay statistics for Farideh, however you wish to use them in your game: introduced as an NPC, or perhaps even as adversary! Abandoned as an infant along with her twin sister and adopted by an exiled dragonborn warrior, Farideh grew to adulthood acutely aware of the drawbacks of being a tiefling. Even with outcast tieflings and dragonborn as her neighbors in the mountain village of Arush Vayem, Farideh knew they watched for the day one of the twins would show the stain of their devilborn blood. Despite doing everything she could to reassure them, including keeping wild Havilar out of trouble, the villagers focused on Farideh as the one who would embrace the dark side of herself. With the upcoming release of Fire in the Blood, we sit down with author Erin M. Evans to discuss her Brimstone Angels series.